Wood cockroaches, also known as wood roaches, are common outdoor dwelling insects native to North America and found throughout Iowa. Their normal habitat is moist woodland areas but they frequently become a household nuisance because they wander into or are carried into houses as "accidental invaders." 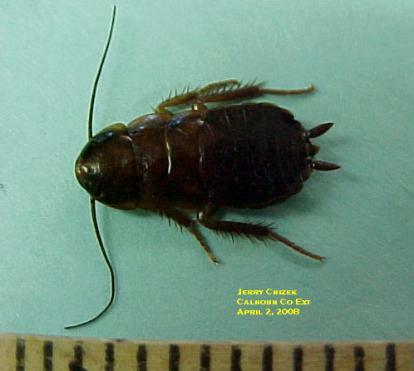 Wood roaches do not thrive and reproduce in homes because they require the consistently moist environment of their natural habitats such as under wood piles or loose bark and in decaying logs. Indoors, their presence is strictly a temporary annoyance. They do not harm the house structure, furnishings or occupants. The sprays and dusts used with success against household cockroach species are of very limited benefit against wood roaches. Exclusion techniques that prevent wood roach entry should be considered. Doors and windows should be tightfitting and cracks, gaps and other possible entry points should be sealed. If a breeding site can be moved or modified (e.g., relocating a wood pile farther from the house) it might help. Also, store firewood outdoors until you are ready to burn it. The males are attracted to lights at night and limiting porch light use in late May through June when males are flying might be of some benefit. Outdoor insecticide barrier treatments around windows and doors and along the foundation or firewood pile are a last resort that may reduce the number of wood roaches that get indoors. Direct application of insecticide to firewood does no good and is discouraged. Wood cockroaches inside need only be picked up discarded. For more information on outdoor insecticides please see this article.